The security guard came to fetch me saying a woman was at the front to see me. I had a friend who was meeting me to help me run a London Girl Geek event so I figured she had arrived early. Following Edward, I emerged in the hallway to see a stranger asking for my signature for a large, fancy black box tied with silver ribbon. It was a large black box the size of at least 2 Dells or Thinkpads stacked with silver writing. This was not a small box and I immediately recognised it for what it was and knew that what it contained was both beautiful and delicious. 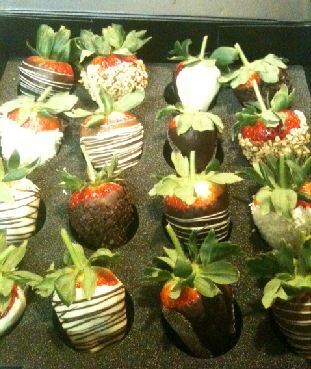 Chocolate covered strawberries for my birthday! But I couldn’t just eat them & not review them! They were far too precious & special not to feature them on the blog. From the moment they arrived in that black box, I knew they were special. A magnetic closure with a ribbon and silver embossed lettering made this a super special gift! How could I spoil it and open it yet knowing the treasure it held inside how could I not? 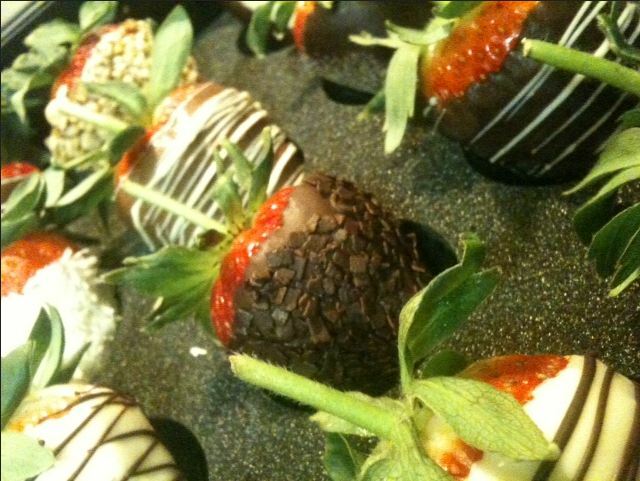 Strawberries dipped in chocolate would be divine but out of season could it still work? Would this be a special case of flavourful berries & delicious chocolate? I have been learning from people like Only Roses that sometimes you really have to pay more for genuine quality. I think in this day & age of supermarket roses & strawberries it is difficult to find quality anything. We can too easily learn to be satisfied with mediocrity and leave quality behind. That’s where I think these strawberries really shine. On the website, the Berry Temptation folk say “We work hard to source beautifully fresh, exquisitely tasty strawberries, which we dip in rich, delicious chocolate and then finish in a variety of colours and decorative details.The end result is a high quality, tasty treat which everyone can enjoy. We invest all our energy in making this a special and totally unforgettable gift. The strawberries I received were extremely large and extremely flavourful. 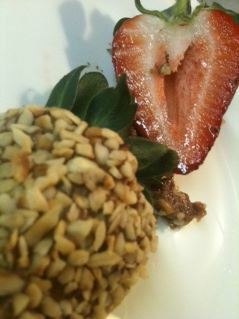 I cannot find the words to express the delicious flavour of the strawberries. Bursting with the most intense strawberry flavour you can imagine, the chocolate was perfectly paired. Both husband and I fought over the dark chocolate ones and luckily there were plenty to go around. They were all just perfectly formed. Perfectly dipped, perfectly flavourful and perfectly chocolaty. I recommend Berry Temptations only for special people – like me 😉 Gift a box to yourself when you complete a major accomplishment like cleaning the kitchen or vacuuming the bedroom. Gift one to yourself on your birthday. If you gift a box to someone for some reason, make sure to gift one to yourself for being so brilliant. But whatever you do, get your hands on some of these because you’re never going to believe how deliciously flavourful they are without trying them. Other chocolate dipped strawberries pale in comparison next to these.